Don't let the fear of entering your bank details online stop you from enjoying online bingo! Ukash is a safe and simple payment solution that will allow you to add funds to your online bingo account without the need to enter your bank details. It's still common that some people don't like using their bank or credit cards online, others may not have access to a bank account but this should not stop you playing the game you love! So how does UKash work? Ukash is a one time payment card, very similar to a mobile phone top-up card that can be used for online payments. You buy your voucher and enter your code online to spend it. You can purchase Ukash from many supermarkets, corner shops, off licenses almost everywhere in the UK. In fact anywhere you see the PayPoint, PayZone and EPay logos in the UK you can buy Ukash money. What happens when I have my UKash voucher? Once you have the Ukash voucher, visit your chosen bingo site and select Ukash as your chosen payment method - on the screen that appears you will be asked to enter the 19 digit number along with the value of the voucher into the payment screen and click deposit and your done! This will vary by Bingo site, but generally sites that accept Ukash pay out by methods such as Ukash vouchers, cheques, bank transfers, eWallets and even credit/debit card. The following bingo sites accept UKash - but also offer an extra bonus when you pay with UKash! Check out the bingo site's terms for full details! 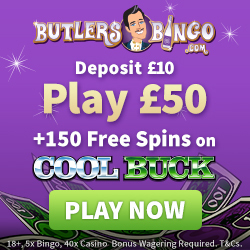 Free spins on Cool Buck Slot. 40x wagering required to withdraw bonus (game weighting applies). 2 day expiry for bonuses. Max bet 6.25 until wagering requirement completed. T&Cs apply. 100% Re-Deposit Bonus Up To £100!